Marks, markers (or key frames) are used for indexing the material for instant following navigation to the selected point. The formed key frames are displayed in Air Manager and News Cut in the separate window "Key Frames" that may be viewed in the window File Monitor. The system of rules and commands (Action) of the SL NEO media-platform allows the user to form a command in one server module and send it to another module. In case of receiving DTMF tones for playout commercials, the service Capture activates the tone, forms the command and sends it to the module for executing the playlist (Program Channel). If you want to form key frames in the material while recording automatically, by DTMF cue-tones, you should send the command from the Capture service to another server module - the recording module (Recorder). Automatic marking may be useful in case of recording the signal of the central station, its following reimposition at the regional station and replacing the commercials, or in case of logging (control recording) the broadcast. Configuring the rule for automatic placing the key frames in the recorded material is similar to the procedure described here. When creating a new rule, choose the name of the service that you want to control in the field Service, by the button "...". Choose Recorder_1 for our task. 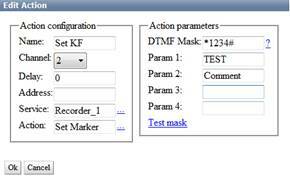 In the field Action choose a command that will place the key frames in case of coincidence of the input DTMF tone with the mask - Set Marker. 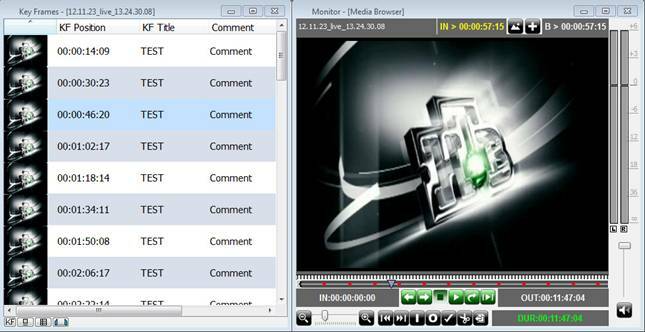 Use this way for configuring the automatic placement of marks according to the analysis of video fragments.